We are giving away a $250 Visa Cash Card and announcing the winner on October 1, 2016. Like us on Facebook. If you already like us on Facebook, please let us know your Facebook name so we can credit you for this action. Not REQUIRED, but gets you a 1 point bonus entry into the sweepstake. Tweet a Follow @freestuffcom message on Twitter. Not REQUIRED, but gets you a 1 point bonus entry into the sweepstake. Note: Each point accumulated counts as a ticket in the Sweepstakes drawing, so a possible 10 points can be earned per participant. We are partnering with RaffleCopter on this sweepstake, so everything is transparent. You will see your points accumulation and who the winner is. Please help us to help you. 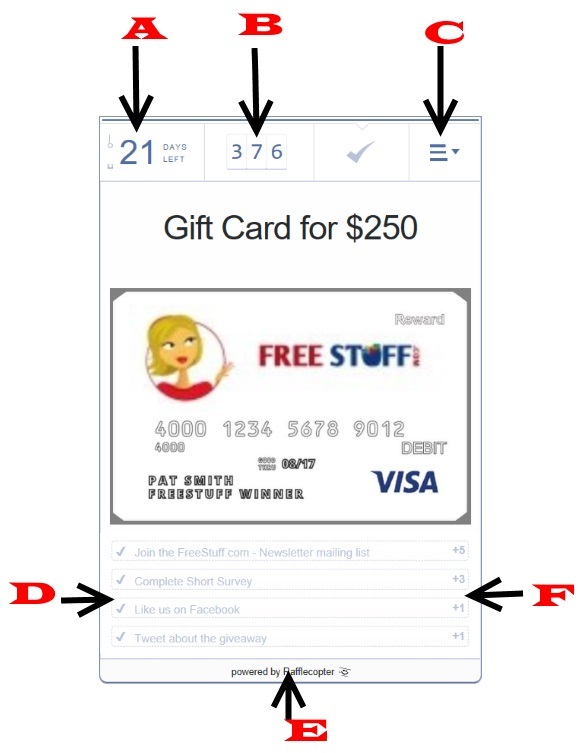 We look forward to rewarding the winner with a $250 Visa Gift Card. It could be you!!!! The Sweepstake starts on September 1, 2016 and ends when the clock rolls forward to September 30, 2016. Scroll down to see explanation of each part of this status panel. To help you understand the sweepstakes status, here are some pointers. A. Time left to enter the sweepstakes. This number counts down each day. C. Click on this link to check YOUR SPECIFIC entry status and how many points you have accumulated. E. This is the 3rd party that we have running this Sweepstakes for us. F. These are the number of entry points that each task is worth. Enter the sweepstakes Mike for a chance. Best of luck! Sorry to hear that Velma. Sweepstakes do have winners and they also have people who do not win. I assure you that this sweepstakes will have a winner announced on Oct 1st. Please make sure you are fully registered for this drawing! Also look for other free samples and giveaways that just require you to complete your mailing address. There are many offers on FreeStuff.com in that category. The bigger value items are usually sweepstake drawings though. — Best wishes. I apply for free stuff and never has received any of the items. It’s nice to see there is still a chance to get free stuff.